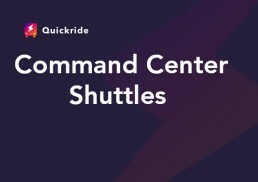 Creating Future or Scheduled rides is easy in the Command Center. 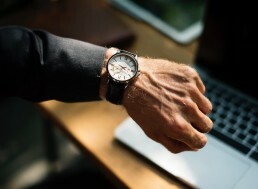 Future or Scheduled rides are a great way of scheduling your trips in advance. Planning trips in advance will help the dealership get the right resources for the job. 1. 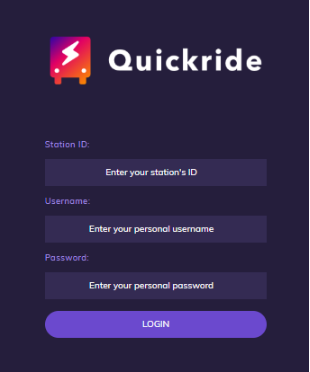 From your internet browser, type https://commandcenter.goquickride.com/login. On the log-in page, enter your Station ID, Username and Password, click log in and you will get directed to the Command Center page. 2. In Command Center, click on Create a New Ride and select Future. a. 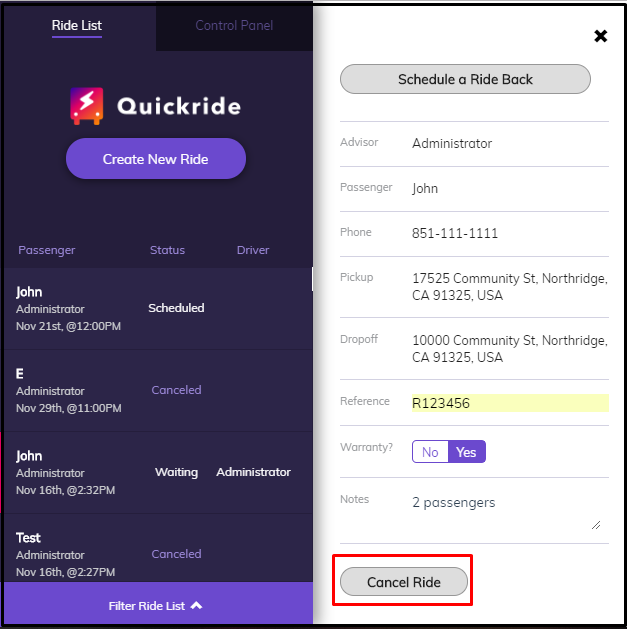 Ride Date – Dealers can set future date and time for the trip/ride request on behalf of the customer. 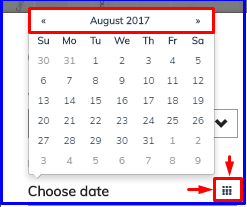 * Choose date – to choose a date, just click on the icon and the calendar option will pop-up. * Set time – to choose a time, just click on the clock icon and you can select the time (hh:mm) am/pm. b. Passenger Name – put in the Customer or Passenger First and Last name for identification. c. Phone Number – correct phone number should be put in the system to ensure that in case they need to get in touch with each another that they will be able to reach the right person. d. To and From – this enables the Dealer put in the passenger destination. In case they are at the Dealership, click on Station and that will auto-populate with the Dealer’s address. 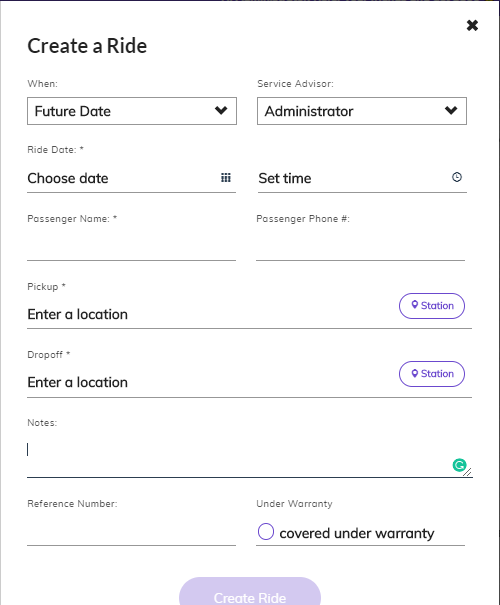 e. Notes – this provides an option to include a short description of the customer/passenger for easy identification. f. Reference Number – this enables the Dealers to use their internal reference number for tracking & documentation. g. Under Warranty – this helps Dealers mark customer’s shuttle request if it’s still covered by warranty or not for reimbursement purposes. ** Tick if the customer is covered by warranty and leave blank if the customer is outside warranty. 4. When the ride gets created, in Command Center, the date and time when the trip is scheduled will be visible. 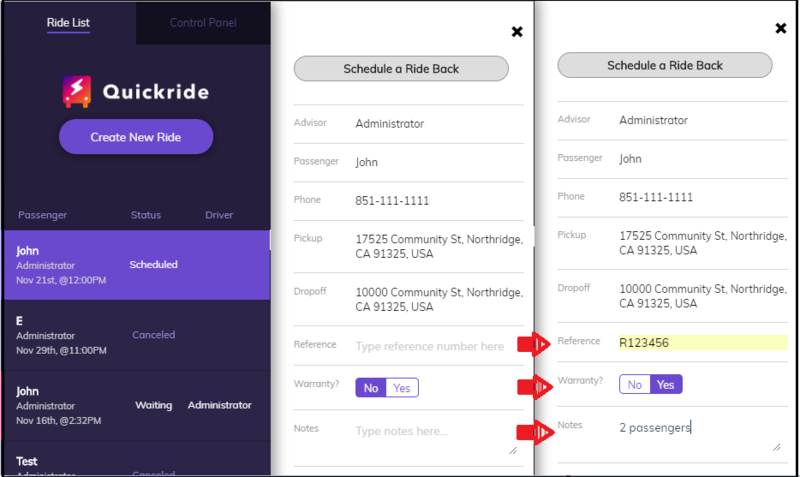 It will get marked as “Scheduled.” Please note that the ride will remain Unassigned to a Driver until such time that the trip is already scheduled. 5. On the day or time, the ride is scheduled, that is when it will get assigned to a driver. Once a Driver has gets assigned to the take the trip, under Driver, it will change from Assigning to the Driver Name. On the map, it will change from Unassigned to Waiting. Please note that “Waiting” doesn’t mean that the customer in the shuttle, it just means that it’s already scheduled. Once the passenger is in the shuttle, it will change to en route if the passenger is in transit to its preferred destination. 6. In case that there is information that needs to be updated or added, that can be done by just going to the assigned trip and updating the information. 7. If the trip request needs to get canceled, go to the bottom part of the ride request and click Cancel. That will immediately end the trip request.